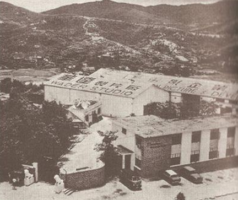 Wader Studio was a major film studio in HK in the 1950s and 1960s, at one time being the largest and most advanced in the industry. Between 1953 and 1973, 1287 films were shot in the studio on Castle Peak Road in Tsuen Wan, representing one fifth of HK’s total film outputs during that period. The famous actor Walter Tso Tat-wah is often mistaken as the founder of Wader because of the similarity of his Chinese name to the studio’s Chinese name but Walter Tso had nothing to do with Wader (see article on Yau Kiu Studio which he had a stake in) and the studio’s actual founder was William C.K. Hu (胡晉康, 1910-1964), a Shanghainese film producer who had an interesting history. According to his bio, Hu was educated at Shen Tien College in Shanghai and allegedly he was an accountant before he became a sales representative for Eastman Kodak in 1932 at the recommendation of his friend, the film director Dan Duyu (但杜宇, 1897-1972, the father of Judy Dan, the first Miss Hong Kong). Hu moved to Hong Kong in 1936 to work for Kodak’s HK branch. As Kodak was a major supplier of motion picture film in addition to photographic film, Hu became close to the major movie producers in Shanghai and HK during his two decades of affiliation with Kodak – particularly Chang Shan-kun (張善琨,1905-57) who became a major force in the industry during the Japanese occupation. After the War, both Chang and Hu were accused of collaboration with the Japanese and in September 1946, they went together to the US and Europe for an extended trip to study the movie industry. Upon their return, they established Great Wall Movie Enterprises in HK in partnership with Yuen Yeung-on with Hu serving as manager. Soon they split over political views with Hu starting Wader Motion Picture (華達電影企業) and Chang starting Hsin Hwa Motion Picture with his wife. When Kodak decided to shut down its HK office in 1951 as the Korean War escalated, Hu formed William CK Hu & Co Ltd (威靈有限公司) to act as its sole agent in HK with offices out of Princess Theater Building on Nathan Road. The original Wader studio was run by Hui Lap-tsai (許立齋) and it was located in Kowloon City near Yau Kiu and other studios. When that studio was burned to the ground in September 1952, Hu approached Ho Khee-yong (何啟榮, 1902-1966) and his brother Ho Khee-siong (何啟湘) of the Kong Ngee (光藝) organization in Singapore to fund the construction of a new studio in Castle Peak Road. As Kong Ngee was one of three major theatre chains in the Malaya peninsula at the time (the other two being Loke Wan-tho’s Cathay and the Shaw brothers) and was keen on securing Cantonese and Mandarin films from HK, the deal was very attractive to the Ho brothers who decided to provide Hu the million-dollar financial backing to launch Wader Motion Picture & Development Co Ltd in 1953 to build the new studio, which he aspired to be the most advanced in the region with state of the art equipment. Given Hu’s background as a supplier rather than a content producer, Wader’s business model from day one was primarily to provide production facilities to other film companies rather than producing its own films. The first film shot at the studio was Far Away (山長水遠) produced by Ping On Co, directed by Chu Kei and starring Cheung Ying, Pak Yin and Mui Yee which was completed in March 1954. According to Far Eastern Economic Review in 1954, the Wader studio “occupies 120,000 square feet and has two buildings with sound stages of 60′ x 120′ x 34′. Its processing department can handle 35,000 feet of film per day and the maximum production capacity is 60 copies every month. Its equipment costing about HK$650,000 was imported from Germany, the UK and USA.” In 1955, the Ho brothers established Kong Ngee Co in HK with director Chun Kim (秦劍, 1926-1969) and many of its films were filmed at Wader. The peak was in 1957-58 when there were 7-8 movie sets at the Wader studio every day, with production in multiple Chinese dialects – Cantonese, Mandarin, Fukienese and Chaozhou, covering all genres from Cantonese opera to modern romantic comedy and employing over 40 full-time professionals. Wader did not produce many of its own films, one of the few exceptions was The Warlord, Yuan Shi-kai in 1957 starring Wang Yuan-long (王元龍), the seasoned actor from Shanghai who co-founded the pro-Taipei HK & Kowloon Cinema & Theatrical Enterprise Free General Association (港九電影戲劇事業自由總會) with Chang and Hu in 1954. When Wang died in 1959, Hu succeeded him as the chairman of the organization. The same year, he was elected director of the Tung Wah Group of Hospitals in HK. Hu also operated China United Film (中國聯合)and United Film Productions (聯合影業), which produced a number of films including a few in the Wong Fei-hung action series. Aside from Chang Shan-kun, Hu was also friends with C.K. Chang, the proprietor of Hwa Lee Weaving and Lai Chi Kok Amusement Park and John Tung of I-Feng Enameling. 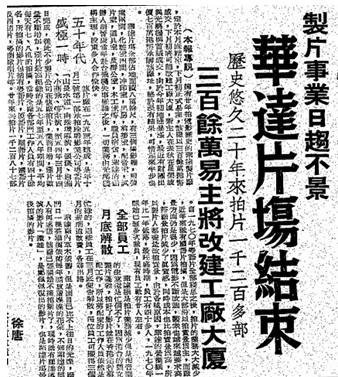 As chairman of the Free General Association, which censored films produced in HK for distribution in Taiwan, the pro-KMT Hu frequently traveled to the island and in June 1964 the CAT flight he was on after the Asia Film Festival crashed near Taichung, killing Hu and many leading figures in the movie industry on board including Cathay studio chief Loke Wan-tho and Mrs. Deacon Chiu. After Hu’s death, the Kong Ngee organization acquired the studio from his widow Jassie Ven-sheng Chu (徐文笙) and continued its operation. 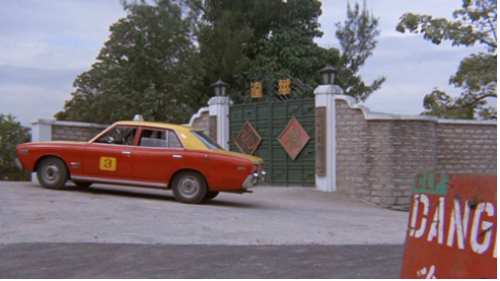 Many more films were shot at the studio during the heydays of Cantonese film production in the 1960s but starting from 1970, independent film production suffered a major slowdown and as a result Wader shrank its workforce down to 20. This article was first posted on 22nd January 2018. Thank you for this excellent article which provided much information about the rise and fall of Wader. However, the comments by philk and C in the Gwulo article (https://gwulo.com/node/37346) suggest that the site is now Blocks B and C, Wah Tat Industrial Centre at 8 Wah Sing St., rather than a park. Chris – you are correct. I will amend the article accordingly. I am a researcher who is working on 1950s/60s HK cinema. Do you think you can email me so we can continue talking in private?